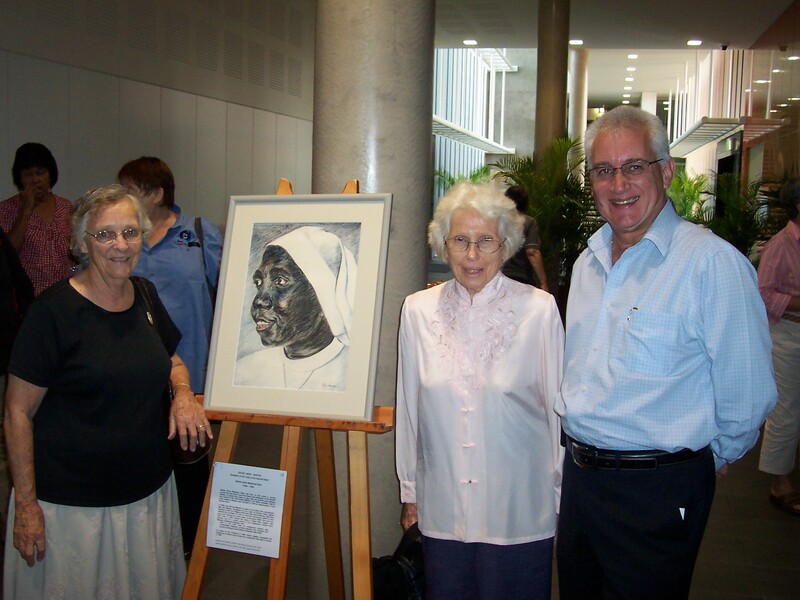 From left to right: Daughters of Our Lady of the Sacred Heart Nursing Sister Jo, Jacqueline “Jaci” O’Brian OAM and Health Minister Kon Vatskalis with the portrait and story of Sister Mary Agatha. Charles Darwin University marked International Nurses Day with an exhibition that tracks the achievements of some the Territory’s extraordinary nursing pioneers. Acting Vice-Chancellor Professor Charles Webb welcomed the Territory’s Health Minister, Kon Vatskalis, who opened the exhibition “From Nightingale to Osburn and Territory pioneers”. Minister Vatskalis said this year marked the 100th International Nurses Day, which commemorated the birth of Florence Nightingale. “This day is celebrated to remember all of the valuable contributions nurses make to society,” he said. Professor Webb said CDU has a long and distinguished history of nursing and nurse studies. “The undergraduate nurse program currently accounts for around 1100 students and makes up the most successful program in terms of numbers at CDU,” he said. Pioneer and leader in Territory nursing Jacqueline “Jaci” O’Brian OAM delivered a speech complete with stories about frontier nurses appearing in the exhibition and the origins of nursing and how it spread from Europe. She spoke in detail about Florence Nightingale, who fought over decades for better hospitals and revolutionised hospital construction and management throughout the world. Eight other frontier nurses who were instrumental in striving for the development of nursing education in the Territory, including Ms O’Brian, also featured in the exhibition. Other photos and artifacts tell the stories of Lorraine Brennan MBE and Llorabel Reynolds OAM, Eileen “Tuffy” Jones OAM worked in Aboriginal settlements and then three decades in leprosy. Of particular historic importance was the portrait of Sister Mary Agatha, a Brinkin Brinkin woman from Daly River country, and her story from bush life to a mission an on to professed religious and nurse. The exhibition will remain on display on level 3 of Orange 12.